A few years ago, I was first hit by the creative urge to make a faithful sans companion to Garamond — not just another humanist sans tipping its hat to the old master, but a sans that really was Garamond. I was going to distill the pure essence of Garamond. Unfortunately, my skills weren't up to the task back then (Typophile veterans might remember). Now, after completing a display Garamond (Cormorant) and a sans (Quinoa), I feel confident enough to try again. My current plan is to start with a low-contrast family that starts with the monolinear «essence» for large display sizes on the light end of the spectrum grows into a robust text-capable workhorse at heavier weights. I'm working with these two masters — Hairline and Bold — and adding a third, intermediate master via the brace trick in Glyphs wherever necessary (for instance, to restrict the strong thinning of shoulders to the heavy weights). A high-contrast family branching off the same Hairline master, but with a new Bold master. First experiments (see below) seem promising. Adobe Latin 4 and Cyrillic coverage. If I can pull it off, a third master (Black) for heavy weights beyond Bold. Not sure if the æsthetics of the essence would survive that ordeal, though. Now, since I will base this project off the existing chassis of Cormorant, I am bound by contract to release this typeface under the Open Font License as well. Unfortunately, Google Fonts has apparently spent all its budget for commissioning new typefaces this year, so I can't get funding through that channel anytime soon. Dave has suggested getting some crowdfunding from Kickstarter, though. Do you think that could work? It has worked for other typefaces in the past... (Though from what I can see, the successful projects are significantly smaller in financial scope than what Google pays...) Do you have any experiences with Kickstarter yourself? Can you recommend it? I don't like Garamond. But this is promising. I worked on the production of <redacted>, and as an insider I can tell you that its Kickstarter didn't work as well as appearances... And frankly this is less rousing for the public. It seems to me that whether this is a 'derivative' of Cormorant is very debatable. Personally, I would argue it isn't. If it was, Cormorant Sand would be a more logical name. Personally, I don't really believe in kickstarter campaigns for typefaces, unless they follow a very strict and special brief. I vaguely recall being allowed by Dave (back in the Expletus days) to release a 'pro' version commercially. I never did that, but I suppose you could? Several people have had this idea before. It might be a good idea to study and learn from those, and position your version to be distinctive. Or is it better to work without such influence, a more pure experience and expression of yourself, but at the risk of duplicating the existing? I also don't think this is derivative of Cormorant, but I am using the Cormorant glyphs file as a starting point for Eau. It saves me some time to have some proportionally appropriate glyphs as a starting point for Eau. Unfortunately, by the OFL rules, that already makes Eau a derivative of Cormorant, even though none of the Cormorant outlines actually make it into Eau. Apparently OFL is more contagious than the Spanish flu. And no, I'm explicitly forbidden from selling a pro version of an OFL typeface. Hrant: It might not have the meme cred of Comic Sans or the socio-historic appeal of the Einstein and Freud typefaces, but I do think there's a good story in it. Everybody owns books printed in Garamond; it's the most timeless typeface of the modern age. Distilling its essence might be seen as a sort of community-serving research. In comparison, the Exo typeface didn't have a story apart from «it has very peculiar look, but it can be very versatile» and still got funded. I am aware that I'm not the first to have this idea, but so far I've never seen a typeface that really did what I have in mind. Most of them seem to go off on a tangent relatively early in the design process. Proza probably comes closest, but as Jasper observed in the Cormorant thread, there's little danger of me duplicating Proza. I think what makes my approach different is that I start from the monolinear distillation and try to make that work in the heavier weights too, as opposed to optimizing for text weights immediately. Hopefully that will preserve a bit more of the Garamond essence and make me less prone to compromises. I think my treatment of the /a is already quite distinctive from all previous attempts, and I like to think it's the most Garamond of them all. Just know that many Kickstarter campaigns aren't making as much as they seem because they're partially covertly self-funded to make the mark and collect the actually-legitimate money. Check your email in a moment. It is called Syntax. Hans Eduard Meyer beat you to it. And then The Foundry "fixed" it with a version sans the ~½° slant. I hate Syntax. I can do better. What was that thing about "I'm rather worried about earning the perpetual scorn of the type designer community"? ;-) No worries, candor trumps sacred cows any day. Franta sets the bar for sans serif Garamonds. Sebastian is mind-blowing. You can also try your own hand at it, even if other people attempted the same thing. Frode: I agree that Sebastian exhibits a very high degree of Garamondness. I find the psychedelic execution a bit hard to swallow, though. Genre-wise, I'd place it alongside FF Oneleigh. Pablo: I wasn't aware of Foundry Sans. It's better than Syntax in many respects, though its goofy /e still smacks of it. It strikes me as cold and mechanical, though. Anyway, I really like where this is going. Maybe I'll just pursue it speculatively and hope Google will adopt it next year. Perfume is supposed to be hard to swallow. ITC Legacy is pretty hard to top, for an Incunabula-channeling sans, IMO. Christian, why not get a bank loan, and retail the typeface? You could make a lot more than Google pays, in the long run. Since you are the copyright owner, your are not bound by the OFL (if your agreement with Google says otherwise, that is a different thing), though I personally would prefer most fonts to be libre anyway. I hate the whole idea of sans versions of Garamond. "I hate the whole idea of sans versions of Garamond"
Why? 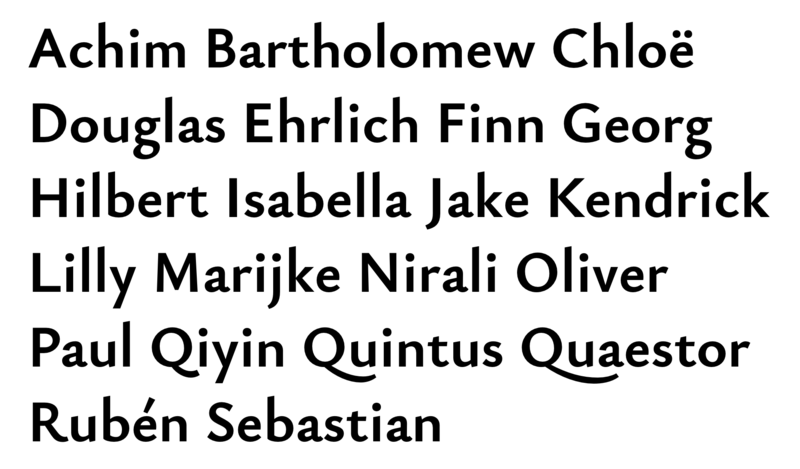 Christian is making it work, and I think it would be useful to have a sans companion to a classic like Garamond. Honestly, all the typefaces mentioned so far have little relation to Garamond. As for going retail: The contract with Google specifically precludes me from selling derivatives of my OFL products. And like Khaled, I do like the idea of releasing a font to the world. Cormorant Garamond alone is already served by Google Fonts 100,000 times a week on more than 500 websites, and the numbers are steadily rising. It feels rewarding. Will this one be open-sourced either? Yes, by necessity. See above. Cristian, since it will be open source ¿Why not uploading the in-progress stuff to Github. Yes, I'll move to GitHub as soon as it reaches a first rudimentary stage of functionality. I've just added the basic numbers (see below); basic punctuation is still missing. In honor of Garamont (not to mention functionality) I'd make the "3" and "5" ascend. I prefer descending threes and fives. Also, in practice, Eau will be matched with contemporary Garamonds, not with incunabula. 6 and 9 look too large to me. 2 and 3 are leaning to the left.